President Bachelet of Chile today fulfilled a 2015 commitment to conserve the waters around Easter Island. The MPA, one of the largest in the world, will protect an area about 740,000km2, roughly the size of Chile’s land area. Announced at the close of the Fourth International Marine Protected Area Congress (IMPAC4) in Chile, the MPA will protect Easter Island from industrial commercial fishing, mining and other extractive activities within the Chilean exclusive economic zone (EEZ) that surrounds the island. 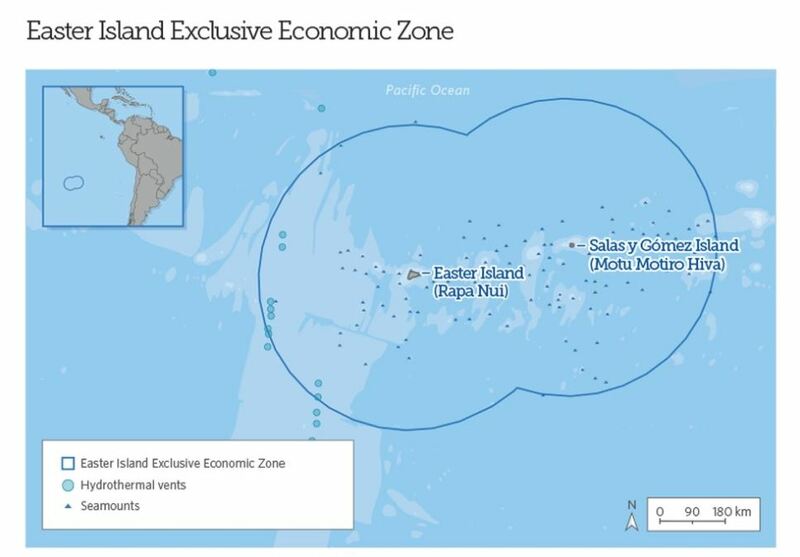 The entire Exclusive Economic Zone of Easter Island is now protected from commercial fishing and other extractive activities such as mining and oil exploration. The preservation of the Rapa Nui’s artisanal fishing practices—fishing from small open boats using hand lines and rocks as weights – will be a key component of the management plans for the MPA and will help preserve the islanders’ way of life. Residents of Easter Island endorsed the designation by a wide margin in a referendum just before the start of IMPAC4; 73 percent supported an MPA that includes artisanal Rapa Nui fishing practices. An island-wide consultation, and the subsequent referendum, were a direct result of the proposal their leaders presented to the Chilean government in 2015.